Soccer season is in full swing with millions of families around the country. For most, it means cold, wet weather and the kids getting mud all over your minivan and home! In the end, it's safe to say that everyone has a great time out at the pitch watching their son or daughter play. 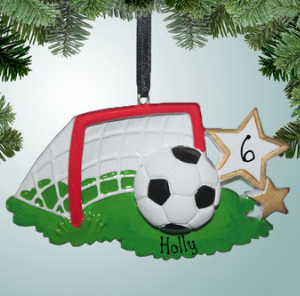 To help capture the great soccer season, Personalizedfree.com offers the best selection of quality personalized Christmas ornaments for soccer online. Sure, there are places that offer everything ever created, but we make it easier for our customers by limiting our selections to what looks the best when it's personalized. Our high-quality handwriting will make your new keepsake one of the highlights of your Christmas tree for years to come. 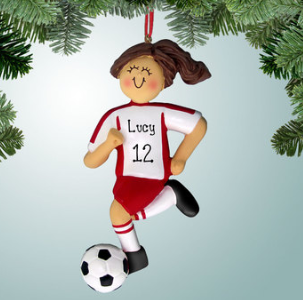 Below is just a sample of the great soccer Christmas ornaments we have to choose from. Please enter our store to see our entire selection by clicking on one of the pictures below.